When David Cameron and Nick Clegg stepped out into the rose garden at No. 10 to launch the first coalition government since the Second World War, some doubted whether the coalition could survive a full term – or even a full year. Five years later, this bold departure for British politics had weathered storms, spending cuts and military strikes, rows, referendums and riots. 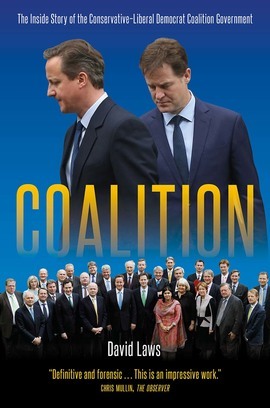 In this compelling insider account, David Laws lays bare the inner workings of the coalition government from its birth in 2010 to its demise in 2015. As a key figure at the heart of government, he witnessed first-hand the triumphs, the tantrums and the tactical manoeuvrings. Now, he brings this experience to bear, revealing how crucial decisions were made and uncovering the often explosive divisions between and within the coalition parties. Honest, insightful and at times shocking, Coalition shines a powerful light on perhaps the most fascinating political partnership of modern times.